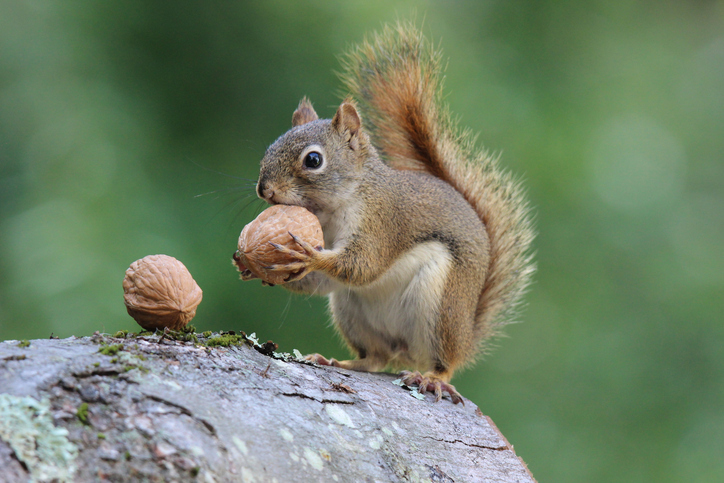 Squirrels are known for being nuts about nuts. Diana cracked the shell of the nut and ate the kernel. I put a bowl of nuts on the table for people to eat with their drinks. Eugene screwed the nuts onto the bolts and made sure they were tight. Ben is a theater nut; he goes to at least two shows every week. Look at that guy dancing on the tables; what a nut! The drunk guy was getting a bit too familiar, so Catriona nutted him. As a vulgar slang term, usually in the plural, nuts are testicles. You can also use the term nutcase to refer to someone who is crazy or, in UK English, you can also say nutter. Nut dates back to before the year 900. The Old English hnutu (pronounced with a very soft h), meant ‘hard seed’ (especially one that was edible), and can be traced back to the Proto-Germanic root hnut– and the Proto-Indo-European root kneu– (nut). It is related to the Old Norse hnot, the Dutch noot, the Old High German hnuz, the German Nuss, the Latin nux, the French noix and the Spanish nuez (among others), all meaning ‘nut,’ as well as a few other words with related, figurative meanings, such as nucleus. The metallic piece used to fasten a bolt has been called a nut since the early 17th century, and nuts has been used as slang for testicles since the early 20th century. The slang use of nut to mean ‘head’ first appeared in the mid-19th century, and gave rise to the adjective nuts, meaning ‘crazy,’ as well as the noun sense of ‘crazy person,’ in the early 20th century, and the UK verb meaning ‘to headbutt someone.’ Nutter, in UK English, appeared in the 17th century, but meant ‘person who gathers nuts.’ Its slang meaning dates back to the mid-20th century.